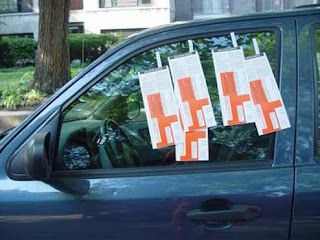 Blog Can I be ticketed in a private parking lot? Can I be ticketed in a private parking lot? The power to impose fines generally requires statutory authority. If you park on private property without the consent of the owner, you are probably trespassing. If you park in a parking lot with a sign that imposes terms on everyone who parks there, you may have entered into a contract with the parking lot owner. However, if there is no statutory authority, then you are probably dealing with a claim for damages. There are two common bases for a claim for damages: trespass and breach of contract. The vehicle must be causing harm to the property owner at the time it is towed, e.g. they cannot tow for prior unpaid damages: Barbour v. The University of British Columbia, 2009 BCSC 425 at para. 50. A property owner can charge a reasonable fee for towing and storage and hold the vehicle until payment: Barbour at para. 53. It is also worth noting that under s. 192 of the Motor Vehicle Act, a vehicle left on private property for more than 72 hours can be towed and the owner of the vehicle must pay all reasonable charges incurred in towing and storing the vehicle. In some cases, the courts have ruled that a sign displayed in or near a parking lot can be considered a contractual offer. If that offer is accepted, then there is a legal contract that can be enforced in court. But it is not clear what constitutes acceptance of the offer. In some cases, the courts have held that such a contract can only be accepted by purchasing a ticket, but in other cases, the mere act of parking on private property has been found to constitute acceptance. Assuming that there is a valid contract, when the property owner sends out a ticket, they are in fact making a claim for breach of contract. In order to enforce the contract, they would have to bring a court action. Unfortunately, there are no clear rules as to when such an action will succeed or fail. If you want a legal opinion as to the enforceability of a particular parking contract claim, you should consult a lawyer. Looking for a motor vehicle law firm? Call us.